While waiting to see how the market should react over the next few months via the equation it will follow, the market will continue to act like a market. Moving up and down, having intra-thesis moves. At the moment the market seems tired. It is approaching resistance, and VIX eased up quite a bit. 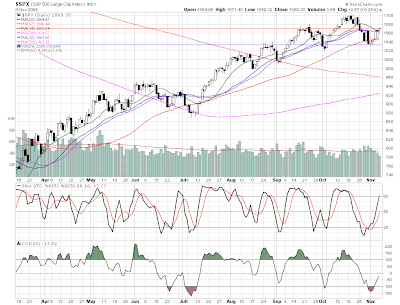 Within the SP500 potential resistance is obvious, but the 'tired' comes into play with the Slow Stoch and CCI. The Slow Stoch is getting overbought as the CCI is not, and I interpret that as weakness. To add support to that, is the VIX. It is approaching the low end support. The VIX looks to want to get lower, which could suggest the market stays at these levels or rises some more. At the moment I am not acting on this, except for selling holdings into the current strength. I will short the spy via Jan Put options when/if the VIX approaches 22 or so. Or when I feel the market is simply too exhausted for its current move.